Greetings from ASCE India Section! 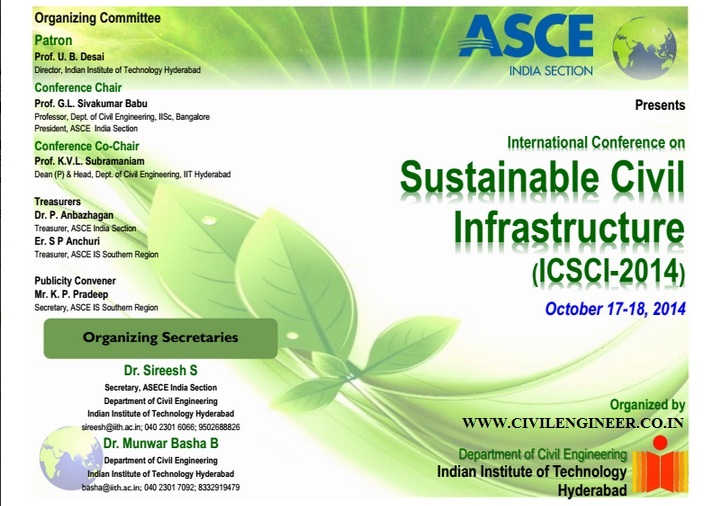 It is a great pleasure for us to inform you that an International Conference on Sustainable Civil Infrastructure (ICSCI 2014) is being organized by American Society of Civil Engineers and Indian Institute of Technology Hyderabad on 17-18, October 2014 at Hyderabad. On behalf of the organizing committee, we would like to invite you to be a part of ICSCI 2014. This international conference will provide a common platform for academia and practitioners to discuss issues related to the Sustainability aspects of infrastructure development in India and in rest of the world. Please find attached conference brochure for further details on the conference. I request you to circulate the conference brochure among your enthusiastic colleagues who would like to participate in the conference as well. We eagerly look forward for your participation in the workshop. Download the Brochure foe complete News and Fees and Venue and Paper Submission Details. Previous Get Your Passport Ready – ASCE’s Annual Conference Goes Global!